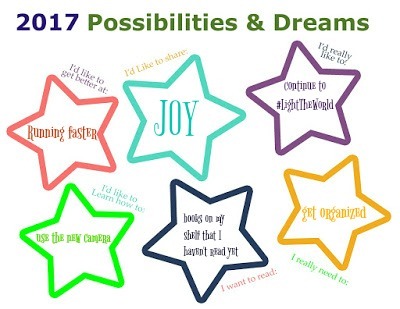 My friend Nancy of Wyoming Breezes invited her readers to fill out the following form as a fun way to think about possibilities and dreams for 2017. I decided to give it a whirl. If you'd like to participate, go to Nancy's blog for a blank form. Thanks for friends, and for possibilities and dreams! Thanks for participating - I love your "star" goals and dreams! Your share star is fabulous: we should all strive to share "JOY."